Tell Us What You Can Do to Help! 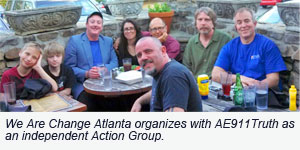 It’s time to go grassroots and build a national community of everyday, action-oriented 9/11 Truth supporters organized at the state and local levels. We must start working together in a concerted way so we can build on the momentum of our recent 9/11 anniversary activities and awaken even more people to what really happened thirteen years ago. If you'd like to help us do that, please fill out this 2-minute Quick Action survey now. Over the past eight years, we at AE911Truth have amassed a contact list of more than 40,000 people. Fully half of them are signers of our petition demanding a new, independent investigation of the World Trade Center's destruction. But 40,000 backers isn't enough. We need to at least triple our supporter base in order to reach the critical mass required to get the attention of the media and influence Congress. 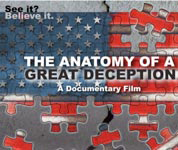 We’re sharing and screening the awesome new 9/11 DVD, The Anatomy of a Great Deception. 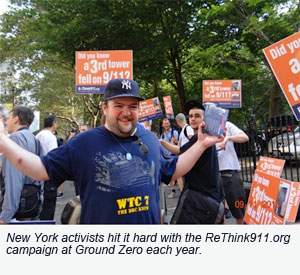 We’re spreading the affirmative, inspiring message of the new 9/11 Truth: Good for America/ Good for the World campaign deep into every community. We’re following up with the successful and unsuccessful candidates who ran for office (federal, state, local) in the recent election. We’re doing what YOU would like to be doing in your community. To let us help you do that, please complete our 2-min. Quick Action Survey now! The next — and biggest — initiative will be yours! It's the one that takes shape in a small 9/11 Truth meeting in your town, then gets shared nationally through the network that you build — the network we'll help you build! Whatever you can do, no matter how modest, will help to build an organization that makes our voice heard and our presence felt – whether it’s sending out meeting reminders, handling publicity, arranging an event, helping with a website, starting a new Action Group, or doing whatever your intuition, interests, and expertise lead you to do. So we are inviting you to take action today. If you agree that a grassroots effort is necessary and want to help, then please complete our 2-min Quick Action survey. We are a non–partisan association of architects, engineers, and affiliates. Our work at AE911Truth is dedicated to the victims, families and all others throughout the world affected by the tragic events of September 11, 2001 and its aftermath. Our mission is to research, compile, and disseminate scientific evidence relative to the destruction of the 3 WTC skyscrapers, calling for a truly open and independent investigation and supporting others in the pursuit of justice. Learn more about us. Contact us if you have questions or comments. Please forward and distribute widely! Copyright © 2014 AE911Truth.org, All rights reserved. 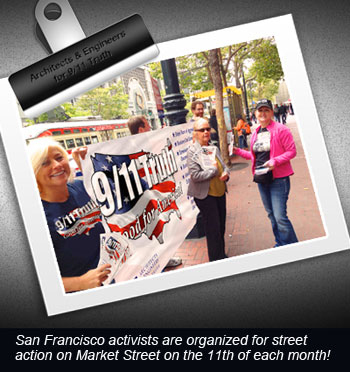 AE911Truth is a 501(c)3 organization. Donations are deductible per codes and regulations. You are receiving this email because you opted in with AE911Truth.org for special email news. Remember, your email is confidential to us and will not be misused in any way.